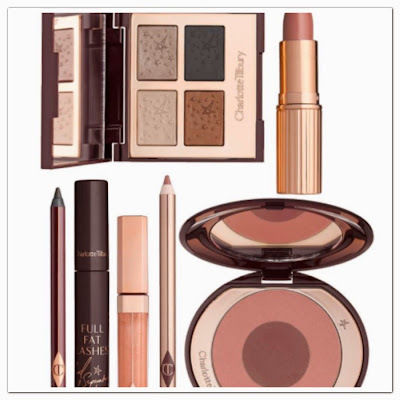 I am heading into London next week, I plan to stop by Selfridges to play around with the Charlotte Tilbury range. I have tested some of her eye shadow palettes before but they are a little pricey so I have never purchased anything but it's Christmas! I love watching her youtube videos and following her instagram... annoyingly she makes make up application look dead easy and effortless. I have picked out my favourites from her line to share with you all. You can click on the photo to take you to the retailer - much easier than me typing out the prices! Have you tried any of her items? Any recommendations? It is a dangerous site!!! I am thinking either one of the eye shadow sets or the brow pencil to test out! I wish I could get my hands on some if these! This line is very intriguing! Click on the items and it will take you to the online retailer to purchase! Thanks Stacey, popping over now! I am after one of the palettes and possibly the brow pencil. I will play around with swatches for the blushes and see how I get on! I think that applies to a few of the guys who have commented! These products look lovely, the Full Fat Lashes mascara is at the top of my Christmas list this year... along with all of the Charlotte Tilbury range that is! I'll have to check out her You Tube videos as i'm always in need of some makeup tips and inspiration! Yes her youtube vids are really good as showing you how to use each of the products. She's got plenty of photos on her instagram, don't forget to follow! Haven't tried them, but they look wonderful! Take a look next time you are shopping! I want pretty much everything from charlotte tilbury! I recently had a makeover at the CT counter in Harvey Nichols in Leeds and the makeup artist was lovely. There was no pressure to buy anything (although I did buy one thing) and my wishlist is now huge as everything that she used on my was spot on. I didn't realise they offer makeover, I will call up tomorrow and ask! Thanks for telling me Leighlee. too bad they do not sell them in stores in the States...only only at one department store. i wanna swatch them! You should be able to get delivery to the states - have google Chie! Only just seen this Emily - I will pop over now!